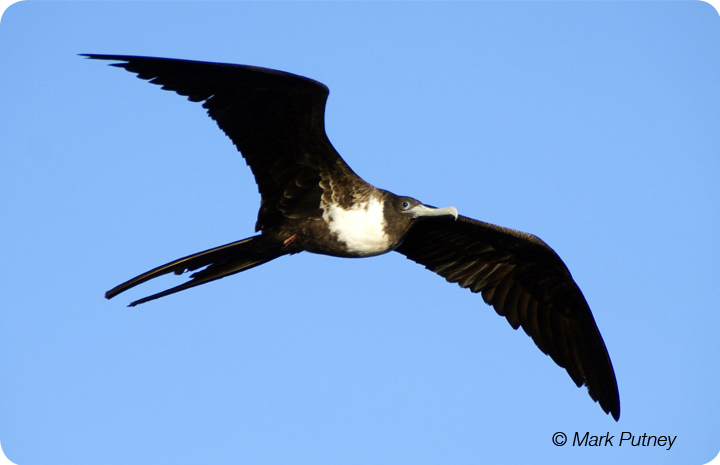 Frigatebirds are the only seabirds that are sexually dimorphic. That is, the males and females look strikingly different. The males are all black except for a spectacular red throat pouch, which they inflate during their elaborate courtship display. Females are black and white. Florida is the only state in which this species nests. They nest in colonies, building a flat nest made up of large twigs on the top of a deciduous tree or shrub on undisturbed mangrove islands. They were once most commonly referred to as ‘Man-o-War’ birds, reflecting their well-known character as a “pirate and a tyrannical freebooter”. Frigatebirds have long swallow-like wings and a streamlined body that enables them to chase, outmaneuver, and steal food from other seabirds such as gulls and terns.